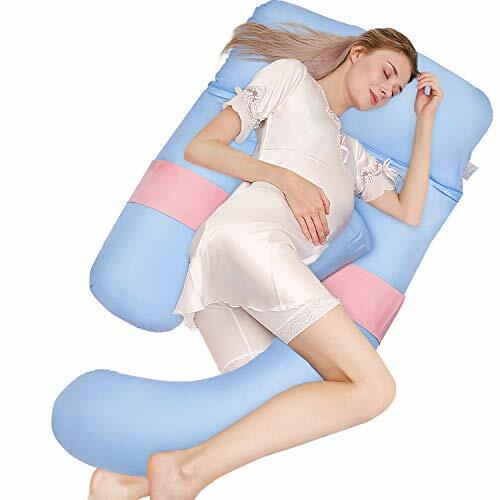 The upgrade-designed U shape pregnancy pillow is a maternity pillow that provides support throughout pregnancy or after pregnancy.This full body pillow not only relieves the soreness of your back, waist, legs, etc. The detachable and combinable design also allows you to adjust your comfortable sleeping position for a good sleep! Why choose joybest Body Pregnancy Pillow? neck, back, shoulders, arms and legs, effectively alleviating fatigue during pregnancy; After pregnancy, can be used as a breastfeeding pillow, baby guardrail. It is also a good choice for those with arthritis, injuries, muscle soreness. Get this quality body pillow now and never sleep like this! Every detail is designed to give you a more comfortable sleep. -The adjustable connection belt meet the needs of different body types. – Detachable design can be applied to the bed, sofa, floor, etc. Due to the difference between the display, there will be a little color difference, please understand. UPGRADED VERSION PREGNANCY PILLOW: The ALL IN ONE pregnancy body pillow can replace the use of multiple bed pillows and meet your different needs with any combination of disassembly.With a u-shaped groove, and the connecting strap and the slant pillow provide you with full body support. COMFORTABLE NIGHT SLEEP: This unique u-shaped oversized pillow fits the human body curve and helps 360° body support your neck, shoulders, back and hips all night, alleviating body aches and swelling of the legs, relieve stress and improve sleep. Not only for pregnant women, but also for everyone who wants to sleep better. PREMIUM AND RICH FILLING MATERIAL: The maternity pillow is made of high-grade 7D PP non-allergenic hollow fiber filler, soft and odorless, high rebound, easy to adjust and no noise, providing comfort for side sleep and maintaining fluffiness. MULTI-PURPOSE&VERSATILE: The body pillow is ideal for creating a relaxed and comfortable position for sleeping, reading, nursing, watching TV, etc. Detachable design is suitable for back sleepers, side sleepers and stomach pillows. It can be used from pregnancy to birth and breastfeeding.A perfect gift for expectant mothers! CUSTOMER GUARANTEE: Your satisfaction has always been our pursuit, if you have any questions about the pregnancy pillow, please feel free to contact us. We offer a money back guarantee.